I Cook and Craft: Chocolate Pudding YUM!!! Today I was in a chocolate mood....OK, everyday I'm in a Chocolate mood! So I stumbled across this recipe for chocolate pudding and I realized I had ALL the ingredients, which doesn't always happen. I want to share it because it's actually the first time I've ever made pudding from scratch. And one of my testers (my daughter's friend Michael) tasted it while it was warm and said it was amazing...Yayyy!!! In a medium sauce pan stir together all the ingredients except the extract or liqueur that you're using. Turn heat to medium high and stir and cook until it thickens...about 5 minutes. 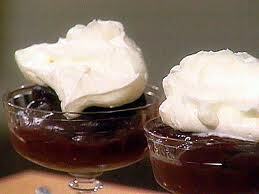 Remove from heat add vanilla extract (or liqueur of choice) and pour into pudding cups. You can serve it warm or chilled. **If you want a deeper chocolate flavor add 2 ounces of bittersweet chocolate, that's been chopped in small pieces, while cooking the pudding. If you don't have ramekins I highly recommend getting a set. They're great and oven safe! If I weren't lactose intolerant, I'd try it. It sounds absolutely delicious! ©Diana DeLaFuente. Watermark theme. Powered by Blogger.